A couple of weeks ago I made a tentative start to reform my troublesome Peacemaking collection. Chucking out all non-stamp items was a start, and so I formed the Aland Islands part of it. But while doing so I wondered whether it might be nice to just use contemporary stamps, rather than anything that goes with the theme. So that's what I tried to do while reorganising my items with reference to Abdullah, Ruler of Jordan. Abdullah plays a part in Margaret MacMillan's book Peacemaking mainly because of his brother Faisel. 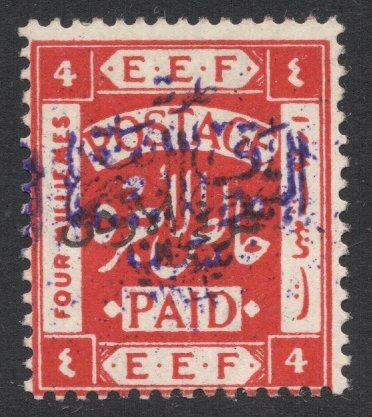 Faisel was more in the limelight because of his dealings with Lawrence of Arabia and his later kingship of Iraq. 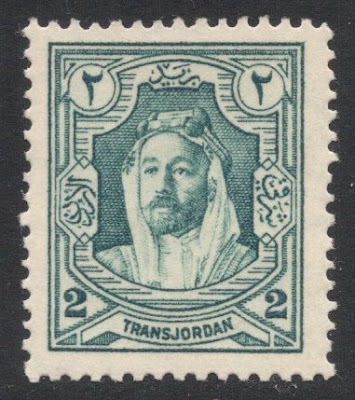 But while Faisel was placed on the Iraqi throne, his brother Abdullah was given the second prize, if you like, of the new state of Transjordan. All this, of course, against a backdrop of an Arab revolt, after it turned out that all promises made to them by the Western powers during World War One, were fast evaporating, leaving them with hardly anything. So, to appease the Arabs, Faisel got Iraq and Abdullah Transjordan. 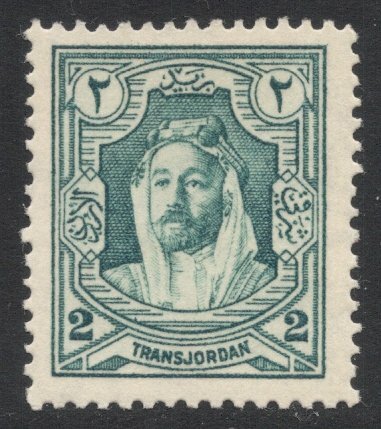 This development left its mark on the Transjordan stamp catalogue, for a set of overprinted stamps was issued in December 1922 to mark Abdullah being made Emir of Transjordan in 1921. 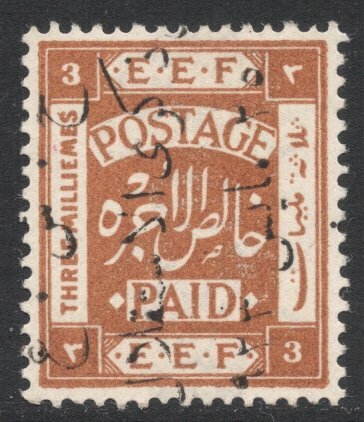 The overprint reads 'Arab Government of the East, April 1921'. This arrangement was made official at a congress in San Remo, Italy, where Transjordan's independence was arranged. 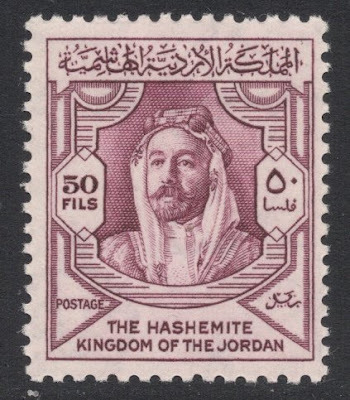 Due to unrelated matters, it took years to finalise all congress details, so the independent Transjordan emirate was only officially established in 1923. That development, too, was marked with an overprinted set, which, unfortunately, proves incredibly hard to find. All I have is the picture below, which is an illustration on a 1998 miniature sheet to mark the 75th anniversary of that Emirate. I know that's cheating a bit, as it's not a contemporary item, so I won't include it in the collection, but I thought I'd at least show you a pic of the stamps I'll hopefuly one day be able to add. This overprint reads 'Arab Government of the East. Commemoration of Independence, 25 May 1923'. Now, Abdullah did not have much of a reputation among Westerners at the time. Many thought him lazy and idle. So everyone was very surprised to find that he proved a very effective ruler. It turned out that when the whole Hashemite dynasty started to crumble, his was the only kingdom that survived, and still survives. It is Abdullah's great-grandson who is now king of the Hashemite Kingdom of Jordan. 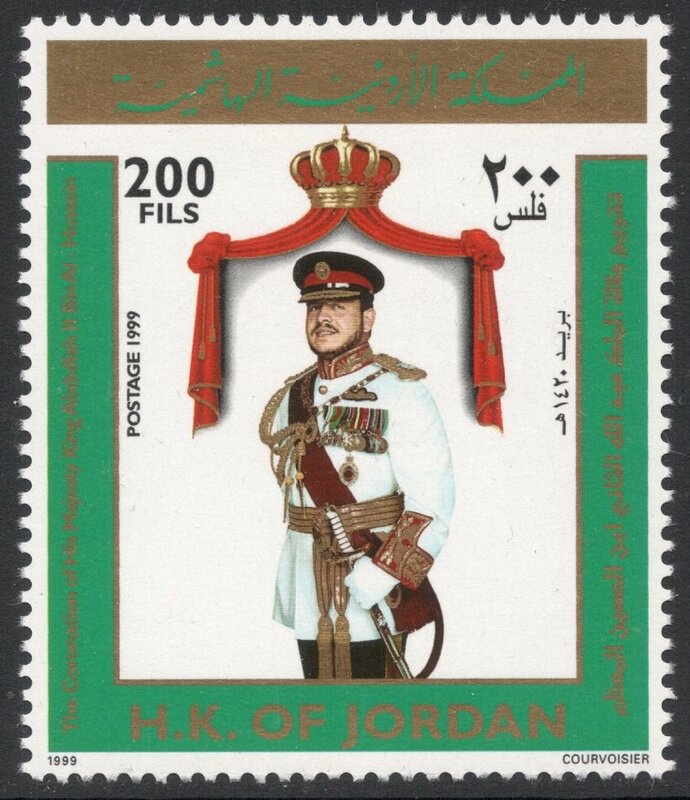 Abdullah II Bin Al-Hussein was crowned in 1999, and his coronation was marked with several sets. 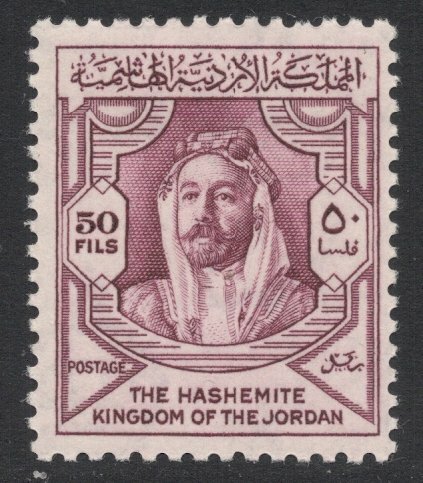 The line of these successful Hashemites was shown in a 2003 issue, of which I'm here showing the four generations, from Abdullah to his great-grandson. I must say, looking back at what I've just shown, I'm quite pleased with this, and I think it works well. Hope you're enjoying it too! Next time I'll show Konrad Adenauer. 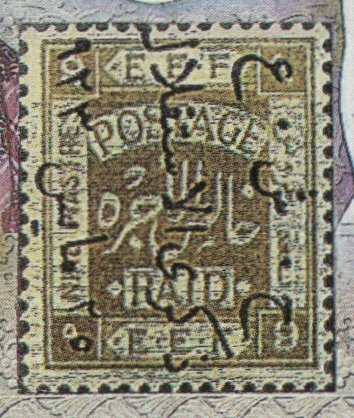 I wrote and scheduled this blog post some time ago, and have since been to Stampex, where, to my utter delight, I managed to find a few values of the missing Transjordan set. So, rather than rewriting the above post, I thought I'd better add a postcscript and show you the real thing. Enjoy!